is a Massachusetts-based micro bakery that produces the best cookies you'll ever taste. Want to add a unique touch to that special occasion? Want to send a gift that makes a lasting impression? Want to put smiles on a whole lot of faces? Our photo cookies and variety of gourmet cookie gifts can be personalized to fit your precise needs. 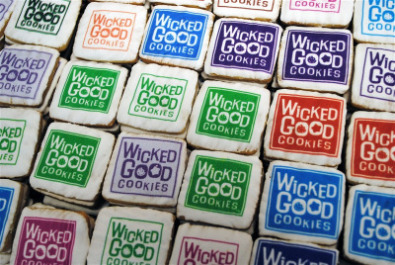 Wicked Good's enthusiastic fans include hundreds of businesses and thousands of consumers just like you. We invite you to learn more by reading our story — and then trying Wicked Good Cookies for yourself. Wicked Good Cookies was born in 1992 and soon earned a loyal following thanks to its delicious gourmet cookies. The Agbay family which consisted of the mom and her recipes, a veteran business executive from the high technology sector dad, and two son's; one with an entrepreneurial studies education from Babson College and the other son with baking and operational expertise, acquired the Company setting out on a journey that's been educational, challenging and a whole lot of fun. Our big breakthrough came in 2003. That's when we acquired a special patented printer that allows us to print photos and other images directly onto our cookies. We were the first to use this technology on cookies — and the only one to have perfected it. And since we own the patent, no one else will be following suit any time soon. Over the past 20 years, we've had the good fortune to build a successful business entirely by word of mouth. We plan to continue that trend by ensuring every Wicked customer has a remarkable experience, from the time they place their order to the moment they polish off one of our delectable cookies. Here is what Senator Edward M. Kennedy had to say about Wicked. The printed cookies from our bakery are printed directly onto the frosting. Pure cookie taste with a delicious image or logo for your party or business! Our cookies are handmade from scratch with all natural ingredients! Each cookie is hand cut and hand frosted for every order. We can ship anywhere in the United States! Your cookies can be ready within 2 business days of your order date, or at a date of your choosing! A Creative Addition to Your Event! Looking to celebrate with edible goodness? Look no further. Use our cookies for your next party or marketing event for a creative and unique way to stand out from the crowd!